Apologies for my absence; the workload at The Counting House has been phenomenal, and I've been crawling back to my hovel exhausted, and lacking my usual joie de vivre. Having said that, on Sunday, I took The Girl to The Wallace Collection to have a look at Fragonard's racy painting "The Swing"; and on the way back to The Silver Beast- parked rakishly (and badly) in Manchester Square, we passed none other than Stara Polska- or if you have been following this blog, "Old Poland". Well, we had to stop by and have a late lunch; and I had a second opportunity to re-try their White Borscht. Otherwise, here's my take on it: First, you need to make a Barscz. In a mixing bowl, mix together a quarter of a pound of dark rye flour, with four cups of warm water. Lie a drying up cloth over it, and leave in a warm place for five to six days, stirring once a day, so that it starts to ferment. Bring a quart of water to a simmer on the hob. Beat together an egg, and a cup of milk, and then stir it into the simmering water. Turn up the heat, let it thicken, and then stir in the Barscz which you've made previously. Thicken it up even more, and season with salt and pepper. In a serving bowl, place rye bread (torn up into chunks), a sliced hard-boiled egg, sliced smoked sausage (kielbasa), and freshly grated horseradish mixed with a little white vinegar. Ladle in the prepared Barscz stock, and finish off the soup with a bit more grated horseradish. Check the seasoning and serve. I reckon that's almost exactly what I had at Old Poland, except they probably add some garlic, and also garnish the whole shooting match with parsley. 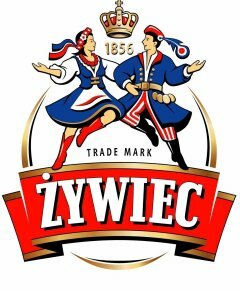 Incidentally, the label I've used as an illustration is for the excellent Zwiec Polish beer. Don't ask me how to pronounce it exactly, but I like the stuff, and of course, it goes beautifully with hearty Polish food.